Visible light is full of color. Visible light is composed of a spectrum of colors that range across the “rainbow” of reds, oranges, yellows, greens, blues, indigos, and violets. This includes white light, which is a combination of various color wavelengths. White light is comprised of a range of colors that can be observed when that light is dispersed through a triangular prism. Yet most lighting is manufactured to produce just one color. Typical white LED and fluorescent light sources produce a single color temperature. Once you buy one of these light sources, you're limited to one color that can’t be changed for different spaces and activities. Even incandescent lighting, which can warm in color as it dims, restricts you to a “fixed curve” with a minimal range of whites. Tunable spectrum lighting offers a range of personalized color. Tunable spectrum lighting allows you to tune the amount of energy across the visible spectrum of colors, enabling a wide range of whites, pastels and saturated colors to be created from a single light source. Crucially, this means that you no longer have to pick the white Correlated Color Temperature (CCT) when selecting a lighting product. After a space is built, paint is applied, and furniture is installed, the final color of light can be adjusted to suit the finished space. While this capability represents a powerful step forward for designers and occupants of indoor environments, not all “tunable” light sources are created equally. 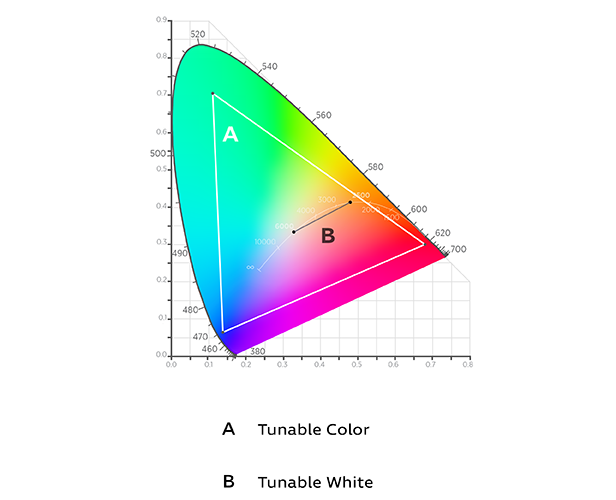 Tunable white light is more limited in its range of whites and colors. Two-channel tunable white solutions are typically composed of a “warm white” and “cool white” light source. By adjusting the relative light output of each, you can create a moderate range of “white” colors between the two. This approach is not suited to all applications because you can only generate white colors on a straight line between the two sources. The result is a limited range of whites that typically go down to just 3,000K or 2,700K. Warm dimming at low light levels will not be possible with this approach. 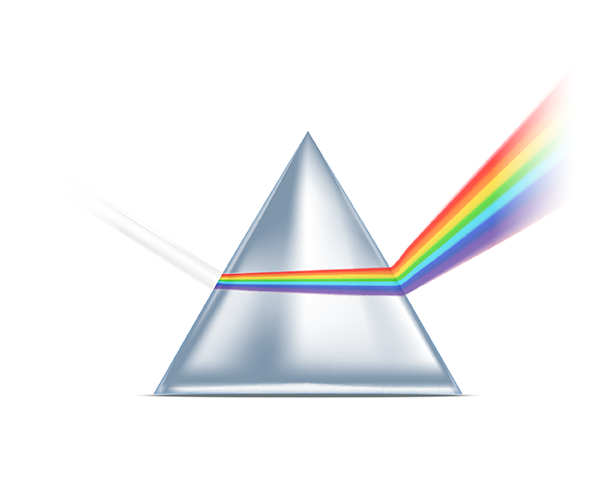 By contrast, tunable spectrum light is composed of multiple, primary light sources. Each of these primary light sources has its own unique spectrum of light. Think of it like a painter’s palette: When mixed together, these “additive primaries” each contribute their unique spectrum to the total mix of light that creates the full spectrum output. The color gamut that can be created is a direct result of each of the contributing primary light sources. 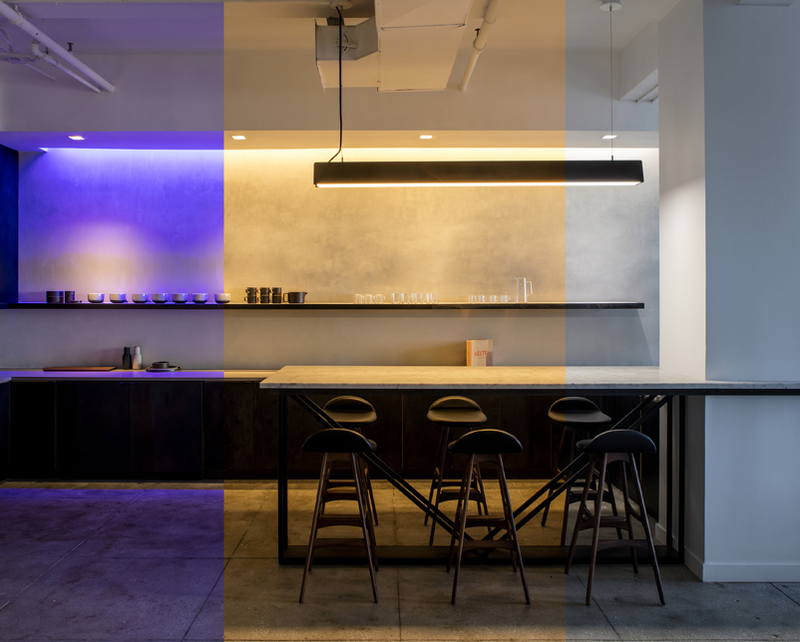 Designers—especially those who focus on high-end, hospitality and luxury spaces—love and rely on the flexibility of tunable color. Whether they’re lighting products on shelves, desks in workspaces, fine works of art, or people themselves, they can dial in the light so everything looks its absolute best. Ketra's full-color, four-channel tunable light system. Proprietary color mixing and driver technology enable us to generate very high quality white light with a high degree of precision -- a color rendering index (CRI) and R9 greater than 90 can be achieved at any point from 2,700K to 5,000K. The result is a full color gamut of tunability that can achieve excellent color rendering, energy efficiency, and quality white light from a single source. Unlimited flexibility and control for transforming your space with light. Ketra’s tunable color system enables users to customize a space for each occupant and task and adapt that space as needs evolve. If the space is repurposed in the future, the lighting can again be tailored to the new needs of the space and occupants. Color tunable light provides the ultimate control for designers to fine-tune a space at each phase of a project and for the lifetime of that space. Beyond its unprecedented range of color temperatures, Ketra has developed a tunable spectrum system that maintains a precise, calibrated color output. Our proprietary closed loop feedback system features optical and thermal control mechanisms that constantly monitor light output, and automatically adjust to maintain consistent color over its lifetime. To learn more about Ketra’s award-winning tunable spectrum lighting solutions, contact a specialist today.